Yesterday was one of those perfect summer beach days. The morning (with the doctors visit that wasn't) started out so horrible, we almost didn't even go. After all the chaos I decided no, we needed to go. Otherwise we would all just be home miserable with each other. On the drive down to Scarborough, Jules and I tried to decide whether to hit up a different beach but ended up at Scarborough as usual with plans to try a different one next time. Perfect sun, waves not nearly as high as they have been and all the kids were having a great time. 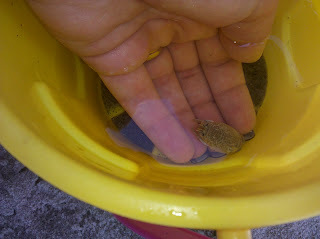 As the Bunny Bee was playing in the water he asked if I could help him catch a crab. Doodle Bop brought over a bucket and after watching a few small ones go back and forth in the waves I caught one. They were so excited to have it in the bucket they ran around with it a little, then asked me to catch more. Do you know what the twins named that first crab? Like Handy Manny - but they had to make the change because of the sand... I kid you not. Not even giving a thought to my perfectly polished nails I just had done at the salon a few days ago, I got in the water and started showing the boys how to dig. Before I knew it I was pulling up crab after crab and the boys were so excited they were squealing and dancing. It made me so happy to be making them so happy, I just kind of lost track of everyone else around me as I kept digging and pulling more out for their buckets. Buckets. After passing some out to the other kids, and spilling some from the bucket, we made it back to our spot and the boys wanted to count them. 55 freaking baby crabs. 55! It was like we had a math AND a science lesson all rolled into one. Or something like that. It was just awesome to see them all so excited about it. The funniest part is that the kids all wanted them divided up into their own buckets but no one would touch them. So there I am passing out handfuls of crabs to the kids, who are also all picky enough to want them placed in buckets of 'clean' sea water - without sand thank you very much. When it was time to go, there were other kids around asking what we would do with them and I was so proud of my guys for telling them they could have all of their crabs. You know they wanted to take them all home as pets but I explained they needed to live at the beach and we could see them again. 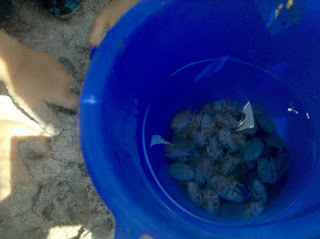 The boys actually said goodbye to all of the crabs and then put them into other kids buckets. On the way home we took the Rt.1 instead of Rt.4 to try avoiding the traffic crush we got stuck in last week. The boys oohed and aahed as we passed the long stretches of water and huge houses. All in all it was the best day at the beach we have had yet and I am so looking forward to doing it again, despite my wrecked manicure. I have a feeling I have started something here when it comes to the boys and they are going to expect buckets of crabs from now one. So yeah, I'll be that girl digging in the water. Call me... the crab whisperer.